The US Food and Drug Administration has approved a new treatment for osteoporosis in postmenopausal women who are at high risk of bone fractures. The FDA announced Tuesday that the drug, called romosozumab, which has the brand name Evenity, works mainly by boosting bone formation and is approved to treat osteoporosis in women with a history of osteoporotic fracture or multiple risk factors for fracture, or those who have not benefited from other types of osteoporosis therapies. “Today’s approval provides women with postmenopausal osteoporosis who are at high risk of fracture with a new treatment that will reduce this risk,” Dr. Hylton V. Joffe, director of the FDA Center for Drug Evaluation and Research’s Division of Bone, Reproductive and Urologic Products, said in the announcement. “But Evenity may increase the risk of heart attack, stroke and cardiovascular death so it’s important to carefully select patients for this therapy, which includes avoiding use in patients who have had a heart attack or stroke within the previous year,” he said. The drug was developed by the pharmaceutical companies Amgen and UCB, which worked together on development since 2004. It is expected to be available from select wholesalers in the United States for physicians to order in about a week, at which time the price will be made publicly available, Amgen spokeswoman Kristen Davis wrote in an email Tuesday. The FDA noted that one dose of Evenity is administered as two back-to-back injections given once a month by a health care professional. No more than 12 doses should be used, so if treatment is still needed after 12 months, other types are encouraged. “The FDA approval of Evenity represents an important therapeutic development for patients who need a medicine that can rapidly increase bone mineral density and help reduce the risk of future fractures within 12 months,” Dr. David M. Reese, executive vice president of research and development at Amgen, said in a news release Tuesday. “Postmenopausal osteoporosis is a significant women’s health issue that far too often gets overlooked. 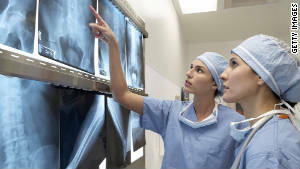 As a leader in bone health with more than 20 years of osteoporosis research experience, Amgen is as committed as ever to combatting this disease to help women at high risk for fracture reduce their risk of a first and subsequent fracture,” he said. The safety and efficacy of Evenity were tested in two clinical trials involving more than 11,000 women with postmenopausal osteoporosis, according to the FDA. Although the trials found the drug to be effective in lowering the risk of a new fracture, the agency noted that there were some side effects, including an increased risk of cardiovascular death, heart attack and stroke. The drug packaging comes with a “boxed warning” stating those risks and that the treatment should not be used in patients who have had a heart attack or stroke within the previous year. Other side effects of Evenity include joint pain and headache, and possible reactions or discomfort at the injection sites. Osteoporosis is a disease that involves low bone mass and deterioration of bone tissue, leading to an increased risk of bone fractures, such as those of the hip, spine and wrist. Of the estimated 10 million people in the United States with osteoporosis, more than 80% are thought to be women.